Rather than grimly predicting the end of the world as suggested by the Mayan calendar, the 2012: Tarot of Ascension takes the positive view that 2012 represents a new era of enlightenment and global transformation for the human race. Despite the name the setting for this deck is medieval. Artist Michele Penco uses muted tones as his oddly disturbing pictures harmonize with elegant dark borders. 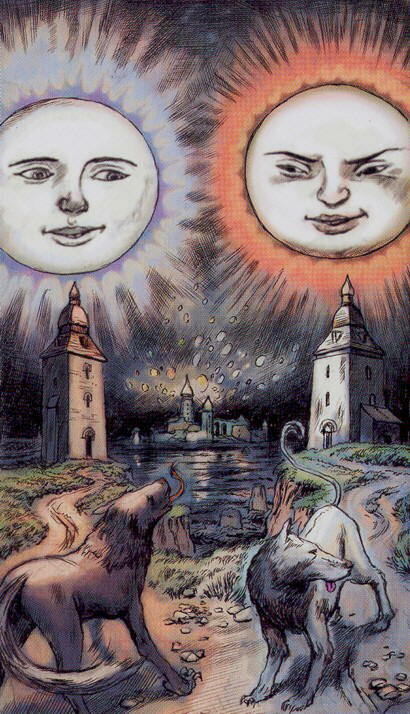 Both the Sun and Moon cards contain not one celestial object in the sky, but a twin as well. This is probably in reference to the apocalyptic predictions that the planet Nibiru will enter the earth's solar system in 2021, appearing first as a second moon in the night sky and later as a second sun in the day time.